Add chicken or pork and ginger to soup stuff. Cook for approx. 2 to 3 hours. Ingredients: Mushroom, Huay San Slice, Barley, Honey Date. 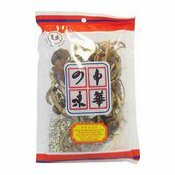 Simply enter your details below and we will send you an e-mail when “Dried Mushroom Soup Stock (進盛茶樹菇湯料)” is back in stock!